A court in Lagos, Nigeria, today dismissed all charges of arms smuggling and illegal entry for the crew of the Russian security tender, Myre Seadiver. Seven crewmen, who have remained on bail at the Russian Embassy in Lagos since the last hearing in July, will be free to leave Nigeria and return home, after the court order is issued tomorrow. 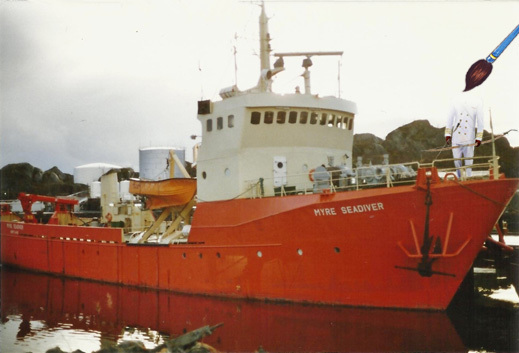 The Myre Seadiver and its original 15-man crew were arrested almost a year ago, on October 20, in the Lagos port roads, as the vessel prepared to leave after a month’s refuelling and repairs, and a change of crew. That story can be read here. It is the second such hostage-taking of Russian mariners by the Nigerian Navy over the past decade; in 2003 the Russian crew of a small Greek-owned oil tanker were jailed for two years over charges of oil smuggling. In both cases, according to Moscow sources, corrupt officers of the Nigerian Navy manipulated local court-ordered arrests of the crewmen to extract bribes and other concessions from Moscow. In the Myre Seadiver case, sources close to the affair claim Nigerian Navy officers operate a lucrative protection scheme for oil tankers and other vessels loading at Nigerian ports or transiting through Nigerian coastal waters. Myre Seadiver, owned and operated by the Moscow-based ship security group Moran Security, has been targeted, the sources say, because Nigerian Navy officers viewed it as an interloper in their sideline business. Apparently more powerful than Nigeria’s Foreign Affairs and Justice Ministries, with which the Russian Ambassador and Foreign Ministry have been negotiating, the Navy officers were said to want maximum publicity for the case, and protracted detention of the crew, as a way of warning other security companies off the Navy’s turf. Last year the Nigerian Navy charged the Myre Seadiver with smuggling the small arms and ammunition which had been declared on the vessel’s entry declaration, as well as illegal entry for the crew, the original complement and a relief crew which had flown into Lagos from Moscow. The Myre Seadiver was seized and held the Beecroft naval base. The vessel has now been released to Moran Security, a company source told Fairplay today. The crewmen were imprisoned for four months until a Lagos court issued bail in February. A change of judges and several trial postponements protracted the case and the detention of the crew. Eight of them were released in June. The decision to dismiss the charges against the remaining seven was taken by the Nigerian Ministry of Justice after a meeting in New York on September 26 between Russian Foreign Minister Sergei Lavrov and his Nigerian counterpart, Foreign Minister, Viola Onvuliri; she had taken over the portfolio a fortnight earlier after Nigeria’s President, Jonathan Goodluck, dismissed her predecessor, Olugbenga Ashiru. There is one loose end in the case, a Russian source told Fairplay. The Lagos agent for the vessel, Blue Seas Maritime Services, which had arranged for a port entry permit and arms declaration prior to the Myre Seadiver’s arrival in September of 2012, is still facing local charges.